Elite Blog Academy Is It Worth The Investment? This post is my (blunt and honest) Elite Blog Academy review. I am addicted to learning. I know, kinda crazy to say, but it’s true. Over the last several years, I have read more than my fair share of blogging books, attended more classes than Hubs is aware of and listened to so many webinars I could do my own in my sleep. What can I say…..I am a sucker for a goods sales page. I thought it would help my new blogging BFF’s out a bit if I did a full on, in your face, honest review of a well-known course. Kind of a “try it before you buy it” to help you decide if this investment is the right fit for you. First off let me say I would NOT be where I am today if it wasn’t for this course. I knew literally nothing at all in January of 2016. But just 10 months later, I was able to quit my two jobs and become a full-time blogger! If that statement alone isn’t a glowing recommendation then I don’t know what is. Warning: This course is not quick and it’s not cheap. This review will lay it all out there so you are aware before you invest your money. Let’s back up just a bit. EBA is also known as, Elite Blog Academy. A full on, intensive course that will take you from idea to business. It covers every aspect of blogging with some areas more in-depth than others. Heads up….know that you will not be proficient in all areas of blogging you will, however, have at the very least, have a basic overview. Ruth Soukup is the founder of EBA and loves blogging. It really shows in her videos and her energy is contagious. She is a no-nonsense type of woman that I enjoy learning from. And to be perfectly honest, really knows what she is talking about. She does give homework and insists on completion before moving on. Although at times this can be frustrating, this is advice I strongly recommend you take. The homework is there to ensure you “get it” and if you move forward without fulling understanding things you will be lost later on. She gives each lesson in video and written form so no matter how you learn best, each option is there. Once you purchase this class you own it forever which is great since I find myself referring back to it again and again. This includes access to any and all upgrades Ruth may make along with bonuses offered to new students each year. The best part is you don’t just purchase this course and then you are on your own. With the course comes membership to their private Facebook group that is run by not just Ruth but a handful of crazy successful bloggers that each make over 6 figures a year. Having access to that knowledge and experience is worth the price tag alone. Even today I am still learning juicy tidbits here and there. So, after all those rainbows and butterflies it’s time to get honest and real. This course is not quick. Plan on taking at least 6-8 months to complete if you have the time to work on it every day. If not, it may take you up to a year. Sure you can fly through it and rush the lessons, but don’t do it. Take your time, do it right and if you don’t understand something stick with it until you do. Backtracking to fix something you rushed through can set you back some time. Trust me on this. Take it at your own pace. Be slow and thorough so you do it right the first time. And if you don’t understand something, I encourage you to get on Facebook and ask. I promise there will be someone there to help. FOR A LIMITED TIME RUTH IS OFFERING FREE TRAINING AND IT ALL BEGINS ON THE 6TH OF MARCH! DON’T MISS THIS AMAZING CHANCE TO SEE IF EBA IS RIGHT FOR YOU! This course is not cheap. EBA comes with a pretty hefty price tag, so this class is ONLY for the serious blogger. If you are not sure that blogging is for you, then this course is not for you. It is important you get yourself into the mindset of a blogger when you purchase this course even if you do not have a blog just yet. Hey, if you are going to plop down $900, then you need to take this class seriously from the get-go. For me, the price tag was a pro more than a con. I knew if I was paying that much money to learn to blog, then by gosh I was going to learn and excel at it. I simply had no other choice. Remember, blogging is a business and you need to think of it that way. And with any new business, an investment will need to be made to get it up and running. For blogging that means hosting, design, software, and yes education. Realizing this early on will help you to make the best choices for you and your business. Doors open just once a year. Elite Blog Academy only opens up once a year in March. If you are reading this and February is months away, don’t fret. Get your name on the EBA wait list. Once you are on that list, you will officially be on EBA’s email list and in the loop. And that is where all the magic happens. Ruth enjoys loving up on her blogging friends and once you are on the list you will get some of that love. Love in the form of free blogging resources you just can’t afford to miss! When you are a blogger, loops are a good thing. You need to be in them…trust me on this! Ninja Tip: If you have months before doors open for EBA, take some time to do a little homework. Write a few articles and see how it all feels. Get your style going so when you are ready to launch you have a good feel for how the words flow. Consider this your test run. If you love writing those articles and can’t wait to do more, then blogging is a go. If, however, writing is like pulling teeth without pain medication. You may want to rethink this. Blogging takes time, lots and lots of time. And you write….a lot. I think it is better to try it before you invest this much money. Write a few things and let your friends take a peek. If they love reading it and you love writing it hooray! You are on your way to becoming a blogger. My EBA review in a nutshell…..
Elite Blog Academy is a step by step class that takes you from start to finish at your own pace. Access to a Facebook Group with 24/7 support. I love having help at my fingertips whenever I need it. This is so important when blogging. Don’t underestimate the power of a support group of like-minded bloggers. EBA covers (almost) every aspect of blogging. From setting up your site, to content, social media, and advertising. EBA will touch on it all. It may not go as in-depth as you would like but an overview can be expected. Comes in video and written form to make learning easy for anyone. Weekly emails to keep you on track and focused. Live Q and A’s that were extremely helpful. And all are hosted by Ruth herself. Being able to ask someone with so much experience and knowledge questions is something not to be overlooked. Loads of checklists, bonuses, cheat sheets and written material. Great printables to help you get organized. You can get your name on the no obligation wait list so you don’t miss when doors open. I’m not gonna lie, this class is expensive, however, I found this a pro as well. If I am dishing out a chunk of change I am going to make sure I not only complete the course but succeed. Don’t underestimate the motivation of a hefty price tag. I just considered this my college course on blogging and an investment that needed to be made. This can be a big let down especially if it’s April! I would suggest writing a few articles to see how you do and how your family and friends react to it. Use this time to “learn” writing skills that will only help you when class does begin again. This is not an overnight class, it is suggested to take 12 weeks (12 units) but I am unaware of anyone that completed it in that amount of time. It took me 8 months, but at the end of that time, I felt truly ready to make my mark in the blogging world. You learn as you go. There is homework and a lot of “doing it scared” tasks that need to be completed to get the most out of this course. Take it seriously and go for it! Not every single thing is covered. The blogging world is constantly changing and so it is unlikely that any course is able to cover it all. I still had to research other topics out there, so be aware of this going in so you are not surprised. This is another example of when the Facebook group is invaluable. If it’s not covered ask about it in the group. You will get tips and answers quickly from experienced bloggers. 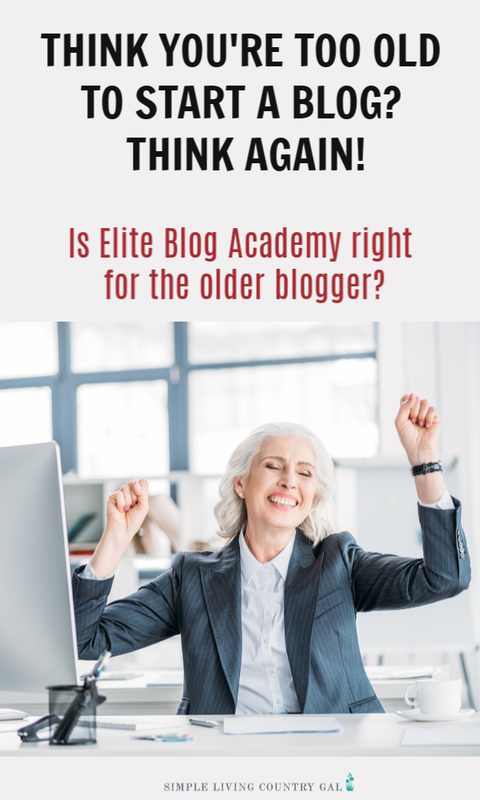 Although there are many resources out there to teach you the basics of blogging, Elite Blog Academy is by far the best I have come across. Hey, I tried to do it on my own and I barely broke even. After EBA I was able to bring in over $1,000 a week blogging. So this course has paid for itself over and over again. If you are serious about becoming a blogger, then you need to be serious about your education. Elite Blog Academy is one serious piece of education. Still not sure if EBA is right for you? Ruth Soukup is hosting a webinar called Passion to Profit and it is coming up on March 6th. I hope you will take advantage and check out Ruth’s amazing style of teaching and see if her class is the right fit for you! I hope you found this review of Elite Blog Academy helpful! Thanks, this is really interesting. It is a lot of money to shell out so it’s good to read honest feedback before investing. I have been wanting to take this course for several years but wondered if it would benefit me. I have been blogging for many years now and only recently got to a healthy part time income. So I’m looking for a course that would push me to the next level.This sounds more geared for beginners. Normally I would just go ahead and take the chance and buy it anyway. You can always learn something, even if you have been blogging for awhile. But with the high price of this course, I’m a little afraid of taking that chance. I know you said you didn’t know anything when you started the course but do you know anyone who was already an established blogger that took the course and it helped them? EBA walks you through every single aspect of blogging. It covers how to set up a blog from scratch, the correct way to write a compelling blog post, the design of your site, growing your list with an effective welcome sequence, social media including Facebook ads, ad networks, affiliate sales, product creation and launching, how to work efficiently, creating a business plan, and hiring a team. It is very in-depth and takes a while to complete. I know many bloggers that had established blogs that took this course and significantly increased their income. However, those bloggers were not doing things the best or even the right way and the course helped them to correct, tweak and improve what they had set up. I totally get it, we as bloggers do like to buy things! And I wish I knew the best answer for you! I do know that Ruth has lots of freebies coming and that may help you to get a feel for what she teaches. If you sign up for my email list you will get access to all her freebies and that may help. I have all of them included in my sequence. 🙂 You can also reach out to me via email anytime if you want to ask more.